The Pilot Better Ballpoint was one of my favorite pens in high school. I used the fine blue ballpoint almost exclusively, and I liked the fact it came in purple as well. There was something about the design and the fine tip that I enjoyed. I grabbed a two-pack of the Pilot Better Retractable at Staples recently trying to bring back old memories of incessant notebook cover doodling. This was a great pen back in the day and the design is timeless. Unfortunately, the ballpoint quality has been lapped by even some of Pilot’s own products. Because of the basic ink performance, the Pilot Better Ballpoint falls in to the “just a pen” category. The black ink is light, there is white space in the lines, and there is ink build up around the tip frequently. Have I used worse ballpoint pens? Absolutely. Can I recommend other ballpoints that are better than this? Dozens. I understand its place in Pilot’s product line - they need an office supply cabinet filler. But when I see Uni-ball making an effort with the Jetstream 101 to have a lower cost, higher quality ballpoint, I think Pilot could do the same with this pen. How much of a design change would it take to get the EasyTouch Pro (aka Acroball) ink into the Better Ballpoint? Make that change and the Pilot Better Ballpoint might live up to its name once again. 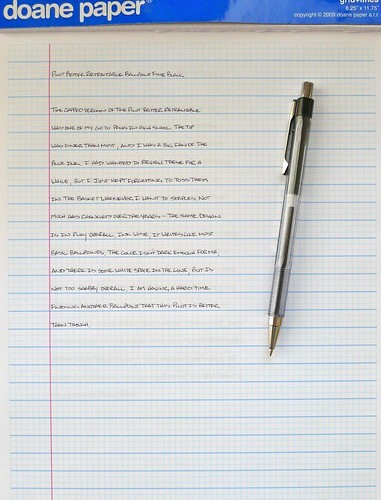 Posted on December 19, 2011 by Brad Dowdy and filed under Better Ballpoint, Pen Reviews, Pilot.